Because of its ornamental value and its medicinal benefits, this hardy herb, often considered as an invasive species, can be a great addition to any garden or backyard. 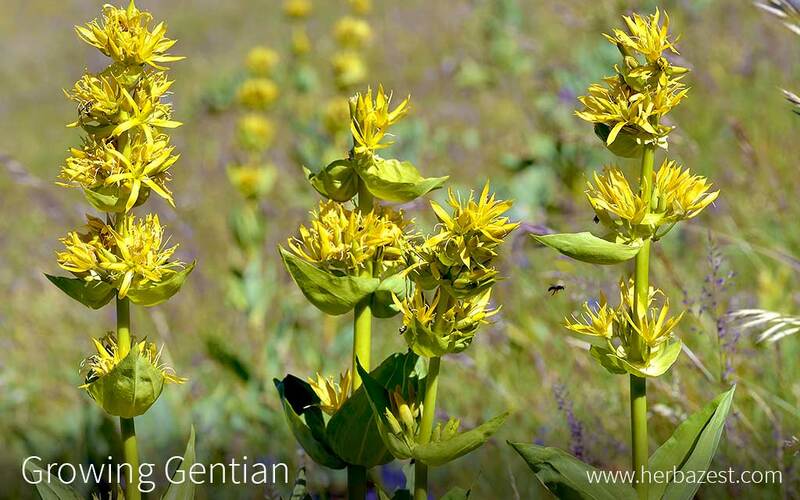 Learn how to cultivate gentian and the factors that influence its growth patterns. Adequate amount to keep the soil properly moist. Gentian cultivation is not a difficult task for gardeners, since this is a plant that naturally grows in the wild. However, in order to ensure adequate development, the following guidelines will be of help. Gentian is a hardy plant, able to adapt to a variety of conditions; however, it grows best in well-drained, loamy soil that is humus-enriched and remains evenly moist. Acidic environments, within a pH range of 4.5 - 5.5, are ideal for optimal growth. Gentians are suited to areas with cool summers, which is why they are usually present in the U.S. only in the Pacific Northwest. They must be planted where they can receive full sun as well as light shelter. Shade is necessary during the hottest part of the day in areas that receive extreme summer heat. Care must be taken to remove any crop residues and plant debris from the area designated for planting gentian, since seedlings are sensitive to the first period of acclimation. Since gentians don't grow well if transplanted from the wild, they are usually propagated by seeds, which must be sown in the fall sothat they can go through a natural stratification process. If properly exposed to cold winter temperatures, they will germinate in spring. However, the plants will be ready for harvesting two to three years after being sown. In order to avoid this long process, it is recommended to buy seedlings from nurseries. Gentian seedlings should be planted in spring, after the frost is gone, when temperatures throughout the nights and days are cool. The seedlings can grow roots 10 - 16 inches (25 - 40 cm) deep; therefore, strong root lifters may be necessary for root harvest or transplant. They should be planted 18 - 24 inches (45 - 60 cm)apart, as too dense of transplant spacing leads to decreased root growth. To produce a good-sized root, plants need to live through four to six growing seasons. While this hardy plant grows well around 54 - 72F (12 - 22C), an ideal temperature for early development will be between 59 - 64F (15 - 18C). Once established, gentian can have a long life of up to 50 years, as long it receives enough water and its roots are not disturbed. Gentians can be propagated vegetatively by dividing the clumps or by lifting and separating offsets indoors, ideally in a greenhouse under controlled temperatures. The cuttings can be grown in individual pots until they are ready to be moved outside. This is normally done in the spring, giving the plant time to root and become acclimated. Gentians may also be propagated by seed in the fall and transplanted outside in the spring. Seeds of gentians have to undergo a period of stratification for two to three months tohelp them germinate before being surface sown. While this is usually done outdoors over the winter, conditions can also be replicated in a controlled environment indoors. However, it can take up to a year to see growth and at least two years for the plants to reach flowering size. In both cases, when seedlings are at least a year old, they can be transplanted to an area with the correct amount and type of fertilizer and mulch. It is important to water gentian plants thoroughly after planting them and throughout the growing process; frequent watering is an important part of gentian plant care, especially during dry spells. The soil should be tested in order to determine if nitrogen, phosphorus, potassium, or other fertilizer bases are needed. During establishment, organic mulch - such as old pine needles - can be added to help retain soil moisture. Depending on personal preference, gentians can be pruned to control the size and shape of the plant by trimming off stems after a few years of growth. Hand-weeding gentian is necessary when they are seedlings for the first two yearsdue to their slow growth. As the plants grow, they will be able to suppress the weeds by themselves. When it comes to the use of herbicides for weed control, it is necessary to consider how different types will be absorbed into the plant at varying amounts. Not many pests and diseases are known to cause detrimental damage to gentian. However, learning about the ones that can cause damage will lead to better management. Aphids areknown to cause damage to stems, leaves, and other tender parts. Most importantly, they assist in the transmission of viruses from plant to plant. To ward off aphids, consider nonchemical controls, as most insecticides will kill off beneficial insects as well. Cucumber mosaic virus (CMV) isa prominent and destructive disease that affects a large variety of woody and herbaceous plants, including gentians. To manage the spread ofthis disease, it is advisable to buy healthy plants and maintain aphid control. Another way to prevent CMV is by propagating plants by seed rather than vegetatively. A blight known as Botrytis cinereaalso commonly affects gentians. It causes very light brown spots with darker borders as well as stem cankers. Any infected parts should be removed and destroyed. Besides pests and diseases, wandering animals - like deer and elks - find gentian plants irresistible and pose a threat to any area. Proper fencing will be enough to keep them away. The roots are the main part of gentians harvested for use. However, they should not be disturbed for at least three years after being transplanted. After that period, they can be carefully dug out in the fall. The main gentian roots can reach up to three feet (1 m) in length. They are hollow and about the thickness of a finger, as well as reddish-brown in the outside and yellow inside. Young leaves can also be harvested and dried to be used as a refrigerant. After the roots are dug up, they are ready to be dried.First, they are cut, cleaned, and washed. In commercial production, root washing machines and shrub cutters are used to finish processing the roots. This process can easily be done manually on a small scale. Slicing the roots may help accelerate the drying process. Gentian's root can be used to make a traditional bitter tonic that stimulates appetite as well as digestion. Underthe right conditions, growing yellow gentian will not only bring color to any garden, but also many benefits from its roots and young leaves. Each step of the growing process can be a challenge, but those who put in the time and effort will be rewarded accordingly.